I love making granola. It’s one of those really easy things to do that people seem to find really impressive. Not only that, but when you’re baking it, your house smells AMAZING – especially if you go a little heavy on the cinnamon, like I do. I mentioned this granola in a previous post about my ambitious Christmas dinner, and I wanted to fulfill my promise to write about it. It’s a great recipe to use as a base for granola experimentation – so feel free to play and have some fun with flavors you like. I’ve found it’s great for giving as a gift – just get some plastic baggies or jars, fill them up, and tie them with a nice ribbon. It tends to stay good for a couple of weeks, but if you leave it too long it will go stale (though it’s so good, I don’t imagine it will sit around on the counter or in the cabinet for too long). As some background, I made this granola yesterday with the help of my friend Rebecca. In fact, this time around she did most of the work preparing this 🙂 I hosted a brunch this morning for some of my co-workers – it’s not very often that we all get a day off together (Happy Martin Luther King Jr. day!). I injured my back earlier this week, and so I ended up selecting recipes for brunch that would be easy to do (i.e. nothing that required heavy mixing or kneading). So – this one is easy, and minimal work is required. Get off the couch and go make some! Toss the oats, coconut, and nuts (almonds) together in a large bowl (note: you might be tempted to toss the dried fruit in the mix as well – don’t. That step will come later. 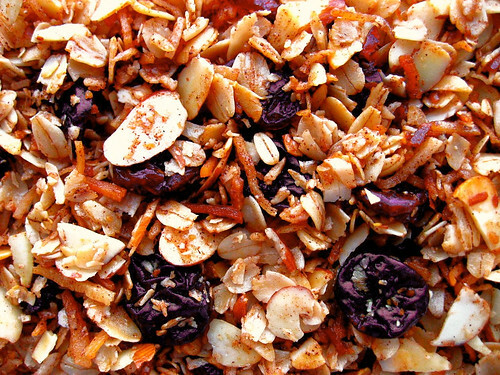 If you add the fruit to this mix before you bake the oats, you’ll end up with rock hard dried fruit. I know… I’ve done this before). Pour the wet mixture over the oat/coconut/nut mixture, and stir with a wooden spoon until until all of the oats and nuts are coated. Pour this mixture into a sheet pan. Bake for approximately 30 minutes (give or take 5 minutes), stirring every 10 minutes. When the granola is a nice golden brown, it’s done. It might still feel a little wet, but as it cools it will dry and become crispy. 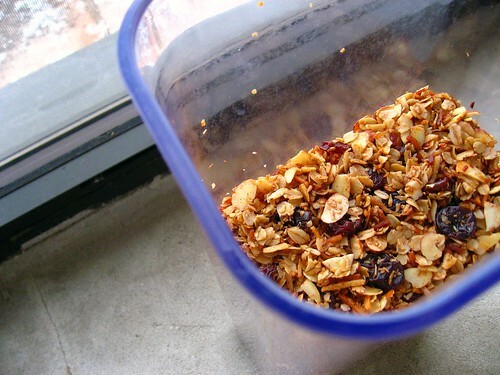 Allow the granola to cool to room temperature, uncovered. Once it is cool, mix in your dried fruit (cherries).